2Lecturer, Dept. of Oral Pathology and Microbiology, YMT Dental College andHospital, Institutional area, Sector-4, Kharghar, Navi Mumbai-410210, India..
*Address correspondence and reprints request to: Gokul S. Lecturer, Dept. of Oral Pathology and Microbiology, YMT Dental College andHospital, Institutional area, Sector-4, Kharghar, Navi Mumbai-410210, India. Shetty S, Gokul S. Keratinization and its Disorders. Oman Med J 2012 Sept; 27(5):348-357. Keratins are a diverse group of structural proteins that form thei ntermediate filament network responsible for maintaining the structural integrity of keratinocytes. In humans, there are around 30 keratin families divided into two groups, namely, acidic and basic keratins, which are arranged in pairs. They are expressed in a highly specific pattern related to the epithelial type and stage of cellular differentiation. A total of 54 functional genes exist which codes for these keratin families. The expression of specific keratin genes is regulated by the differentiation of epithelial cells within the stratifying squamous epithelium. Mutations in most of these genes are now associated with specific tissue fragility disorders which may manifest both in skin and mucosa depending on the expression pattern. The keratins and keratin-associated proteins are useful as differentiation markers because their expression is both region specific and differentiation specific. Antibodies to keratin are considered as important tissue differentiation markers and therefore are an integral aid in diagnostic pathology. 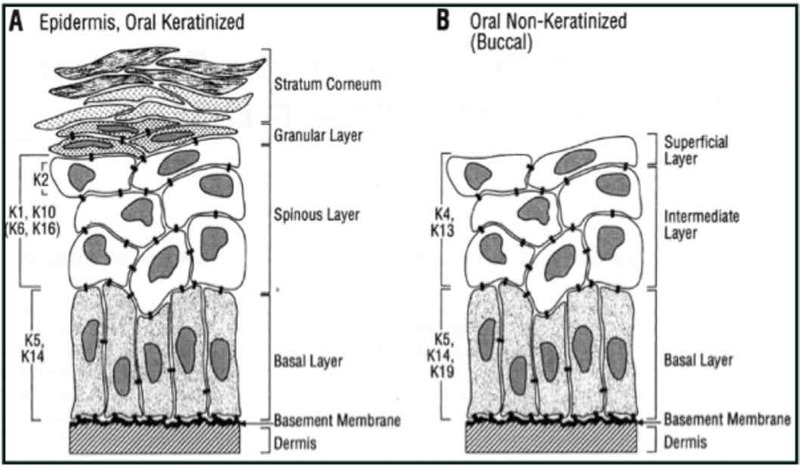 The present review discusses the structure of keratin, the various types of keratin and their distribution and the disorders associated with keratinization with special emphasis on the disorders of the oralcavity. A brief note on the clinical significance of keratin is also mentioned. Keywords: Keratinization; Keratins; Distribution; Keratinization disorders; Keratin antibodies. Intermediate filaments, which serve as a scaffold for the cytoskeleton, are chemically very stable, long and unbranched filaments that aggregate into bundles of varying diameter ranging from 7 to 12 nm. Keratins that form the intermediate filaments are expressed exclusively in the epithelial cells regardless of the germ layer origin of these cells.4 Among the various families and sub-families of intermediate filament proteins, keratin is an important type due to its high molecular diversity. Keratins play a major functional role in the integrity and mechanical stability of both the single epithelial cells and via cell to cell contacts of that of the epithelial tissues.5 There are around 30 families of keratin proteins divided into two groups namely acidic and basic which are arranged in pairs. Keratins and certain keratin associated proteins are useful as markers of differentiation because their expression is both region and differentiation specific. Historically, important discoveries in regard to keratin were made in the 1970’s. One was the finding of the spontaneous self assembly and polymerization of keratin filaments from denatured, soluble keratin proteins by dialysis in vitro.6 Different types of keratin were subsequently discovered using various methods. The advances in laboratory diagnostics have also aided in easier identification and characterization of keratin. Currently, the different types of keratin and their associated proteins serve as important markers of differentiation thus aiding in diagnosis of various pathological conditions. The keratin proteins have a uniform mode of distribution among the various layers of epithelium which gives an indication of the disease process. Also, various disorders are associated with defects in the keratin and their associated proteins which may manifest in skin or oral cavity or both. 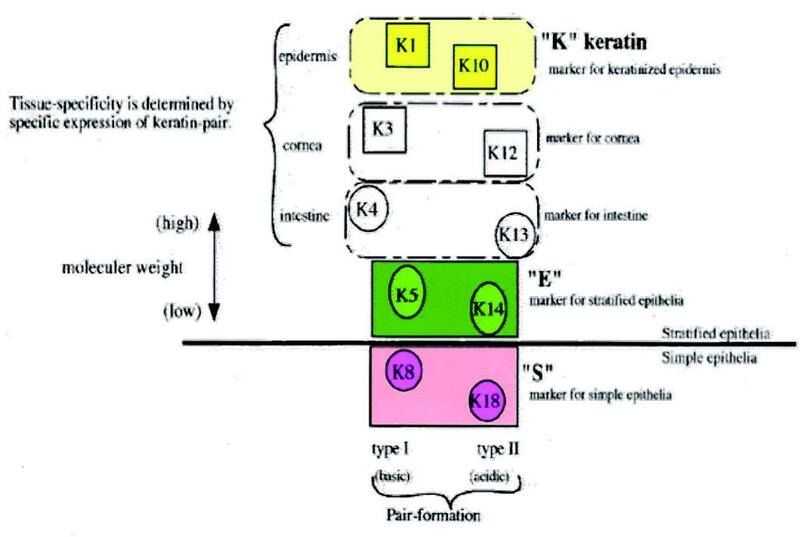 Figure 1: Distribution of keratin. 1. Primary keratins are those keratins which are always synthesized by the epithelial cells on a regular basis, e.g., K8/18 in simple epithelia, K5/14 in stratified epithelia. 2. Secondary keratins are those types of keratins which are produced by the epithelial cells in addition to or instead of primary keratins, e.g., K7/19 in simple epithelia, K15, and K6/16 in stratified epithelia. During epidermal differentiation, low molecular weight keratins 5/14 of the basal layer are replaced by high molecular weight keratins 1/10,11 which can be used as a marker of keratinization. • Soft keratin: Found in the epidermis of skin in the form of flattened non-nucleated scales that slough continually. The disulfide links are fewer in number which allows some stretching but returns to normal upon relaxation of tension. • Alpha: The X-ray diffraction pattern of this type resembles that of α-helix with a 5.1 Å spacing. The α-helix is right handed and has 3.6 residues per turn. The hydrogen bonding occurs within one polypeptide chain. • Beta: In the X-ray diffraction pattern of this type, periodic repeats were 3.5 and 7 angstroms. The helix is right-handed with an average of 6 residues. The hydrogen bonding occurs between neighboring polypeptide chains. • Type I family includes keratins numbered 9- 20 which are composed of acidic proteins, with a molecular weight 40-56 kDa and pI- 4.9-5.4. • Low molecular weight keratins: Include keratins with a molecular weight of 40kDa. These keratins are mainly distributed in glandular and simple epithelia. • Intermediate molecular weight keratins: Include keratins with a molecular weight intermediate between 40kDa and 57kDa and are found in stratified epithelia. • Keratins may also be involved in the transport of membrane bound vesicles in the cytoplasm of the epithelial cells. In general, low molecular weight keratins are expressed in glandular and simple epithelia, intermediate molecular weight keratins are expressed in stratified epithelia and high molecular weight keratins are expressed in keratinized stratified epithelia. 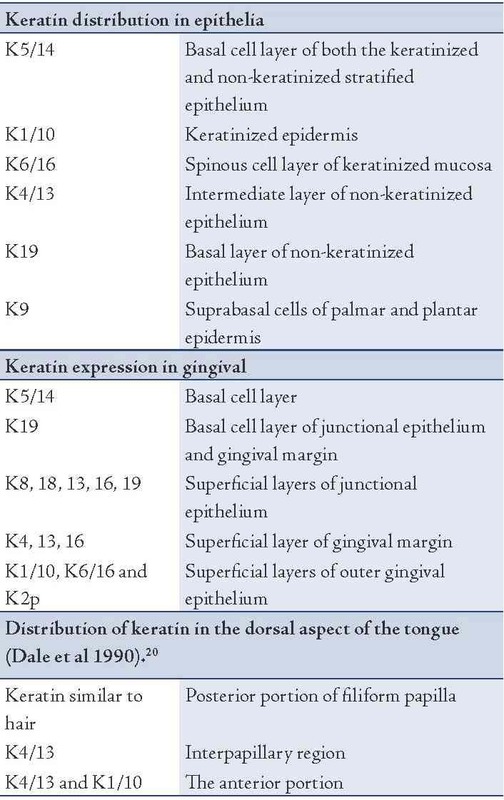 K8/18 is the primary keratin and K7 is the secondary keratin of the simple epithelium.19 The expression of major proteins in the various layers of epithelia, gingiva and dorsal aspect of tongue is given in Table 1. Table 1: Distribution of major keratins. Filaggrin is a cationic protein which aids in dense packing of keratin within a cornified cell layer. They are synthesized in the granular cell layer as a large precursor molecule (profilaggrin), stored in keratohyaline granules and converted to filaggrin upon transition of granular cells to fully differentiated cornified cells.20 They facilitate disulfide bond formation between keratin polypeptide chains. They may also play a role in maintaining the osmolarity and flexibility of epidermis.28 Expression of filaggrin is enhanced in conditions of hyperkeratinization and thus serve as useful markers to distinguish non-keratinized from keratinized epithelia. Tricohyalin is expressed in keratinizing filiform papilla of tongue, nail matrix, new born foreskin epidermis and in isolated cells of normal adult epidermis.29 These are single stranded α-helical rod that binds keratin intermediate filaments by ionic interactions. They function as intercellular cement as well as cross bridging proteins. It may play a role in sequestering calcium and thus regulate the activity of calcium dependent enzymes.1 Desmosomal proteins link epithelial cells to each other. They help in attachment of keratin intermediate filament cytoskeleton to cell surface. They are inclusive of integral proteins (desmoglein and desmocollin), cytoplasmic adapter proteins (desmoplakin and plakoglobin) and plaque associated proteins (plakophilin, envoplakin, and periplakin). Various factors that regulate epithelial differentiation include the role of adjacent mesenchymal tissue, components of extracellular matrix, growth factors like epidermal growth factor, transforming growth factor alpha and beta, retinoids and calcium. The role of retinoids in epithelial differentiation is depicted in Table 2. Table 2: Effects of retinoids on various keratin proteins. A wide range of disorders occur as a result of mutation in the gene encoding for the various keratin proteins. These disorders comprise of the lesions affecting the skin and mucous membrane depending on the distribution of keratin and certain disorders may present with both skin and oral manifestations. The disorders affecting the skin are presented in Table 3. Table 3: Keratinization disorders of the skin. DC is a rare X-linked disorder first described by Zinsser in 1906 and later reported in detail by Engmen and Cole thus being referred to as Cole- Engmen syndrome or Zinsser-Cole-Engmen syndrome.43 The disease is sometimes inherited as an autosomal dominant disorder. The genes that undergo mutation include dyskerin (X-linked), TINF2, and TERT (autosomal dominant).44 DC occurs mostly in males between the age group of 5-12 years and is caused by mutation in DKC1 gene thus disrupting the normal maintainence of telomerase.39 This could be a fatal condition in which majority of the patients develop aplastic anemia and sometimes malignant transformation of the keratotic white patch may occur.43 The lesion is characterized by triad of dystrophy of nails with failure of nails to form a nail plate, white thickening of the oral mucosa, and extensive areas of net-like pigmentation of the skin.32 Both the hard and soft tissues of oral cavity are affected by DC. The tongue and buccal mucosa initially develop bullae that are followed by erosions and eventually develop leukoplakic lesions. Severe periodontal destruction may occur due to anomalies in ectodermally derived structures and diminished host response caused by neutropenia.45 Biopsy of the oral lesions shows hyperkeratosis with epithelial atrophy. As the lesions progresses, epithelial dysplasia develops until frank squamous cell carcinoma develops. Prognosis is unpredictable and sufficient follow-up is required. This condition is predominantly a skin lesion with subtle oral lesions. Skin lesions may first appear as yellow-brown papules commonly in forehead, scalp, back and chest. Involvement of the hand is very common and the lesions include punctate keratosis, palmar pits and hemmorhagic macules. The oral lesions are asymptomatic and consist of multiple normal colored or white flat topped papules which if numerous gives rise to cobble-stone appearance primarily affecting the hard palate and alveolar mucosa. Warty dyskeratoderma is an uncommon solitary lesion occurring in skin or oral mucosa which has histopathological similarity to Darier’s disease and hence is referred to as isolated Darier’s disease. They typically present as a solitary, asymptomatic, pink or white umblicated papule on keratinized mucosa especially the hard palate and alveolar ridges. A warty or rough surface is noted in some lesions. In addition to the lesions occurring primarily due to defect in keratinization, certain lesions exist which histopathologically demonstrate hyperkeratosis irrespective of the etiological factor. Such lesions are collectively referred to as keratinizing lesions of the oral cavity and are inclusive of reactive lesions (frictional keratosis, smokeless tobacco induced keratosis, nicotine stomatitis, hairy tongue, hairy leukoplakia), immune mediated lesions (lichen planus, discoid lupus erythematosus, graft versus host disease), pre-neoplastic and neoplastic diseases (actinic cheilosis, leukoplakia, proliferative verrucous leukoplakia, verrucous carcinoma, squamous cell carcinoma), and infections (squamous cell papilloma, verruca vulgaris, condyloma accuminatum, molluscum contagiosum and verruciform xanthoma). Keratin expression patterns are characteristic for distinct stages during cellular epithelial differentiation from embryonal to adult and of the internal maturation program during development. Epithelial tumors including metastasis most widely retain their keratin patterns of their normal origin; thus the determination of the keratin patterns of tumors is widely exploited for cell and tumor typing. Therefore keratins have evolved to be one of the most potent epithelial differentiation and tumor markers in cell biology, embryology, and surgical pathology. Specific antibodies against several keratins are routinely used for immunohistochemical typing of carcinoma in tumor diagnostics. In general, K8/18 is found to strongly stain in most adenocarcinoma, hepatocellular carcinoma, renal cell carcinoma, and neuroendocrine carcinoma. Another clinical application is the monitoring of fragments of these keratins in the serum as serological tumor markers to monitor cancer load, cancer progression, and response to therapy.5 The detection of soluble K19 fragments in the serum released by carcinoma cells by the CYFRA 21-1 has found broad clinical application as a marker to monitor treatment and evaluate response to therapy.51 K20 is a potent immunohistochemical marker in tumor pathology since its peculiar expression spectrum is essentially maintained in the corresponding primary and metastatic carcinoma.52 K20 positivity is seen in majority of gastric adenocarcinoma, transitional cell carcinoma, and Merkel cell carcinoma.53 K20 is considered to be a consistent marker for Merkel cell carcinoma. Keratins and keratinization has been the subject of research for a long time owing to the various disorders of keratinization affecting the skin and oral cavity and also the role of keratins in tumor diagnosis. Considerable progress in this field has been achieved in the recent past courtesy to the advancement in technologies helpful in determining the keratin pattern and expression. Knowledge of the expression patterns of various keratin markers; their distribution and functions plays a vital role in understanding of the tumor pathology. Also the identification of keratin antibodies as markers of diagnostic pathology has received tremendous boost and is a specialized area of interest currently. Thus a thorough knowledge regarding the various aspects of keratin will be helpful in diagnosis and treatment of various keratinization disorders and also contribute to diagnostic and prognostic significance in tumor pathology. 1. Presland RB, Dale BA. Epithelial structural proteins of the skin and oral cavity: function in health and disease. Crit Rev Oral Biol Med 2000;11(4):383-408. 2. Nanci A. Tencate’s Oral Histology 2003; 6th edtn, Elsevier: 336-48. 3. Shroeder HE. Differentiation of human oral epithelia 1981. Krager, Basel. 4. Bragulla HH, Homberger DG. Structure and functions of keratin proteins in simple, stratified, keratinized and cornified epithelia. J Anat 2009 Apr;214(4):516-559. 5. Moll R, Divo M, Langbein L. The human keratins: biology and pathology. Histochem Cell Biol 2008 Jun;129(6):705-733. 6. Steinert PM, Idler WW, Zimmerman SB. Self-assembly of bovine epidermal keratin filaments in vitro. J Mol Biol 1976 Dec;108(3):547-567. 7. Franke WW, Schiller DL, Moll R, Winter S, Schmid E, Engelbrecht I, et al. Diversity of cytokeratins. Differentiation specific expression of cytokeratin polypeptides in epithelial cells and tissues. J Mol Biol 1981 Dec;153(4):933-959. 8. Roop DR, Chang CK, Titterington L, Meyers CA, Stanley JR, Steinhart PM, et al. Syntehtic peptides corresponding to keratin subunits elicit highly specific antibodies. J Biochem 1984;259:8037-8040. 9. Wu KC, Bryan JT, Morasso MI, Jang SI, Lee JH, Yang JM, et al. Coiled-coil trigger motifs in the 1B and 2B rod domain segments are required for the stability of keratin intermediate filaments. Mol Biol Cell 2000 Oct;11(10):3539-3558. 10. Hesse M, Magin TM, Weber K. Genes for intermediate filament proteins and the draft sequence of the human genome: novel keratin genes and a surprisingly high number of pseudogenes related to keratin genes 8 and 18. J Cell Sci 2001 Jul;114(Pt 14):2569-2575. 11. Coulombe PA, Tong X, Mazzalupo S, Wang Z, Wong P. Great promises yet to be fulfilled: defining keratin intermediate filament function in vivo. Eur J Cell Biol 2004 Dec;83(11-12):735-746. 12. Lane EB, McLean WH. Keratins and skin disorders. J Pathol 2004 Nov;204(4):355-366. 13. Hatzfeld M, Burba M. Function of type I and type II keratin head domains: their role in dimer, tetramer and filament formation. J Cell Sci 1994 Jul;107(Pt 7):1959-1972. 14. Er Rafik M, Doucet J, Briki F. The intermediate filament architecture as determined by X-ray diffraction modeling of hard alpha-keratin. Biophys J 2004 Jun;86(6):3893-3904. 15. Magin TM, Vijayaraj P, Leube RE. Structural and regulatory functions of keratins. Exp Cell Res 2007 Jun;313(10):2021-2032. 16. Coulombe PA, Omary MB. ‘Hard’ and ‘soft’ principles defining the structure, function and regulation of keratin intermediate filaments. Curr Opin Cell Biol 2002 Feb;14(1):110-122. 17. Vaidya MM, Kanojia D. Keratins: markers of cell differentiation or regulators of cell differentiation? J Biosci 2007 Jun;32(4):629-634. 18. Gu LH, Coulombe PA. Keratin function in skin epithelia: a broadening palette with surprising shades. Curr Opin Cell Biol 2007 Feb;19(1):13-23. 19. Pekny M, Lane EB. Intermediate filaments and stress. Exp Cell Res 2007 Jun;313(10):2244-2254. 20. Dale BA, Salonen J, Jones AH. 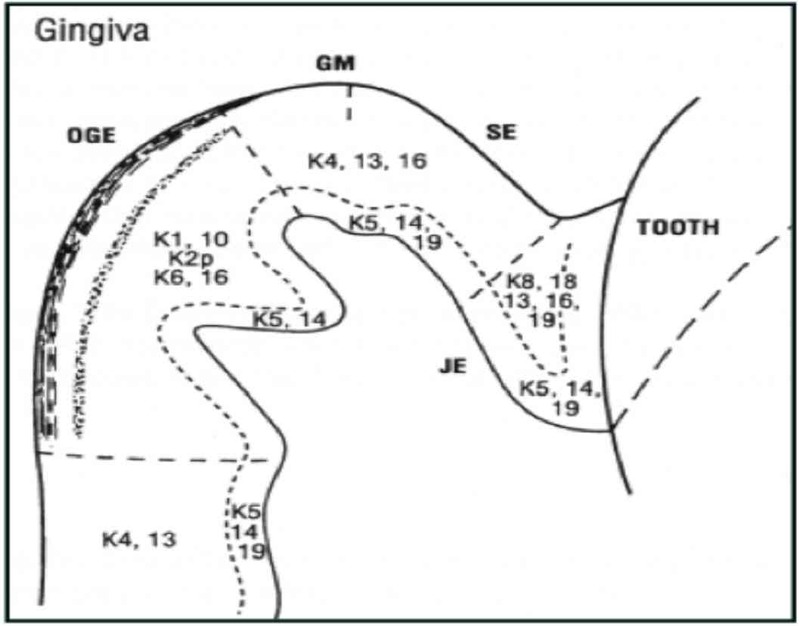 New approaches and concepts in the study of differentiation of oral epithelia. Crit Rev Oral Biol Med 1990;1(3):167-190. 21. Rogers MA, Winter H, Langbein L, Bleiler R, Schweizer J. The human type I keratin gene family: characterization of new hair follicle specific members and evaluation of the chromosome 17q21.2 gene domain. Differentiation 2004 Dec;72(9-10):527-540. 22. Rogers MA, Edler L, Winter H, Langbein L, Beckmann I, Schweizer J. Characterization of new members of the human type II keratin gene family and a general evaluation of the keratin gene domain on chromosome 12q13.13. J Invest Dermatol 2005 Mar;124(3):536-544. 23. Witt M, Kasper M. Distribution of cytokeratin filaments and vimentin in developing human taste buds. Anat Embryol (Berl) 1999 Apr;199(4):291-299. 24. Freedberg IM, Tomic-Canic M, Komine M, Blumenberg M. Keratins and the keratinocyte activation cycle. J Invest Dermatol 2001 May;116(5):633-640. 25. Ross MH, Pawlina W. Histology: A text and atlas. With correlated cell and molecular biology. 5th ed 2006. Lippincott Williams and Wilkins. 26. Jessen H. Two types of keratohyalin granules. J Ultrastruct Res 1970 Oct;33(1):95-115. 27. Eckert RL, Sturniolo MT, Broome AM, Ruse M, Rorke EA. Transglutaminase function in epidermis. J Invest Dermatol 2005 Mar;124(3):481-492. 28. Steinert PM, Marekov LN. 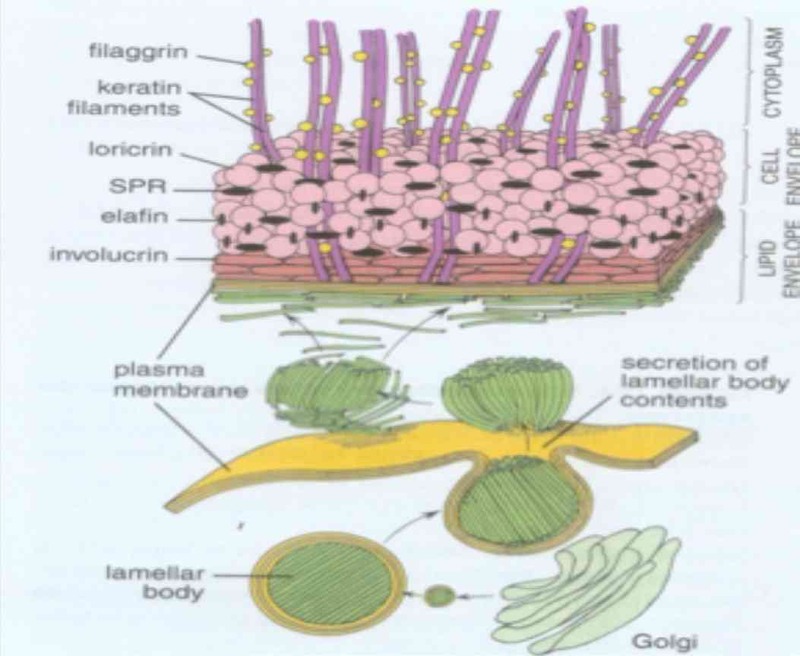 The proteins elafin, filaggrin, keratin intermediate filaments, loricrin, and small proline-rich proteins 1 and 2 are isodipeptide cross-linked components of the human epidermal cornified cell envelope. J Biol Chem 1995 Jul;270(30):17702-17711. 29. Hamilton EH, Payne RE Jr, O’Keefe EJ. Trichohyalin: presence in the granular layer and stratum corneum of normal human epidermis. J Invest Dermatol 1991 May;96(5):666-672. 30. Schweizer J, Bowden PE, Coulombe PA, Langbein L, Lane EB, Magin TM, et al. New consensus nomenclature for mammalian keratins. J Cell Biol 2006 Jul;174(2):169-174. 31. Uitto J, Richard G, McGrath JA. Diseases of epidermal keratins and their linker proteins. Exp Cell Res 2007 Jun;313(10):1995-2009. 32. Elder DE, Elenitsas R, Johnson BL, Murphy GF. Lever’s histopathology of skin. 9th edtn. Chapter 6- Congenital diseases (Genodermatoses). Edited by Johnson JR, Honig P. Lippincott Williams & Wilkins 2005:139-77. 33. Shimizu H. Shimizu’s text book of dermatology. Chapter 5. Disorders of abnormal keratinization. Hokkaido University Press 2005:229-37. 34. Freedberg MI, Eisen A, Wolff K, Austen FK, Goldsmith LA, Katz S. Fitzpatrick’s Dermatology in general medicine. 6th edtn; 2003. McGraw Hill. 35. Osawa R, Akiyama M, Shimizu H. Filaggrin gene defects and the risk of developing allergic disorders. Allergol Int 2011 Mar;60(1):1-9. 36. Akdeniz N, Karadag AS, Calka O, Ediz L, Karadag R, Celen I. A case report of icthyosis vulgaris with arthropathy and ophthalmic findings. J Turk Acad Dermatol 2011;5(3):1153-1156. 37. Gruber R, Elias PM, Crumrine D, Lin TK, Brandner JM, Hachem JP, et al. Filaggrin genotype in ichthyosis vulgaris predicts abnormalities in epidermal structure and function. Am J Pathol 2011 May;178(5):2252-2263. 38. Burns DA, Breathnach SM, Cox N & Griffiths CE. Rook’s Text book of dermatology. 7th edtn. Wiley Blackwell 2004; 3:41.1-41.24. 39. Neville BW, Damm DD, Allen CM, Bouquot JE. Oral and maxillofacial pathology. 3rd edtn. Elsevier Saunders 2009:741-815. 40. Marcushamer M, King DL, McGuff S. White sponge nevus: case report. Pediatr Dent 1995 Nov-Dec;17(7):458-459. 41. Leachman SA, Kaspar RL, Fleckman P, Florell SR, Smith FJ, McLean WH, et al. Clinical and pathological features of pachyonychia congenita. J Investig Dermatol Symp Proc 2005 Oct;10(1):3-17. 42. McLean WH, Hansen CD, Eliason MJ, Smith FJ. The phenotypic and molecular genetic features of pachyonychia congenita. J Invest Dermatol 2011 May;131(5):1015-1017. 43. Auluck A. Dyskeratosis congenita. Report of a case with literature review. Med Oral Patol Oral Cir Bucal 2007 Sep;12(5):E369-E373. 44. Sasa GS, Ribes-Zamora A, Nelson ND, Bertuch AA. Three novel truncating TINF2 mutations causing severe dyskeratosis congenita in early childhood. Clin Genet 2012 May;81(5):470-478. 45. Yavuzyilmaz E, Yamalik N, Yetgin S, Kansu O. Oral-dental findings in dyskeratosis congenita. J Oral Pathol Med 1992 Jul;21(6):280-284. 46. Allingham RR, Seo B, Rampersaud E, Bembe M, Challa P, Liu N, et al. A duplication in chromosome 4q35 is associated with hereditary benign intraepithelial dyskeratosis. Am J Hum Genet 2001 Feb;68(2):491-494. 47. Scully C, Challacombe SJ. Pemphigus vulgaris: update on etiopathogenesis, oral manifestations, and management. Crit Rev Oral Biol Med 2002;13(5):397-408. 48. Black M, Mignogna MD, Scully C, Number II. Number II. Pemphigus vulgaris. Oral Dis 2005 May;11(3):119-130. 49. Robinson JC, Lozada-Nur F, Frieden I. Oral pemphigus vulgaris: a review of the literature and a report on the management of 12 cases. Oral Surg Oral Med Oral Pathol Oral Radiol Endod 1997 Oct;84(4):349-355. 50. Morgan PR, Shirlaw PJ, Johnson NW, Leigh IM, Lane EB. Potential applications of anti-keratin antibodies in oral diagnosis. J Oral Pathol 1987 Apr;16(4):212-222. 51. Barak V, Goike H, Panaretakis KW, Einarsson R. Clinical utility of cytokeratins as tumor markers. Clin Biochem 2004 Jul;37(7):529-540. 52. Moll R, Lowe A, Laufer J, Franke WW. CK 20 in human carcinoma. A new histodiagnostic marker detected by monoclonal antibodies. Am J Pathol 1992;14(2):427-447. 54. Moll R. Cytokeratins as markers of differentiation in the diagnosis of epithelial tumors. Subcell Biochem 1998;31:205-262. 55. Paladini RD, Takahashi K, Bravo NS, Coulombe PA. Onset of re-epithelialization after skin injury correlates with a reorganization of keratin filaments in wound edge keratinocytes: defining a potential role for keratin 16. J Cell Biol 1996 Feb;132(3):381-397. 56. Fillies T, Werkmeister R, Packeisen J, Brandt B, Morin P, Weingart D, et al. Cytokeratin 8/18 expression indicates a poor prognosis in squamous cell carcinomas of the oral cavity. BMC Cancer 2006;6:10. 57. Sobral AP, Loducca SV, Kowalski LP, Santos IR, Almeida OP, Araújo NS, et al. Immunohistochemical distinction of high-grade mucoepidermoid carcinoma and epidermoid carcinoma of the parotid region. Oral Oncol 2002 Jul;38(5):437-440. 58. Pires FR, Chen SY, da Cruz Perez DE, de Almeida OP, Kowalski LP. Cytokeratin expression in central mucoepidermoid carcinoma and glandular odontogenic cyst. Oral Oncol 2004 May;40(5):545-551. 59. Matthews JB, Mason GI, Browne RM. Epithelial cell markers and proliferating cells in odontogenic jaw cysts. J Pathol 1988 Dec;156(4):283-290. 60. Safadi RA, Musleh AS, Al-Khateeb TH, Hamasha AA. Analysis of immunohistochemical expression of k19 in oral epithelial dysplasia and oral squamous cell carcinoma using color deconvolution-image analysis method. Head Neck Pathol 2010 Dec;4(4):282-289.